Norco Elementary School students were greeted by administrators on the first day of school Aug. 10.Among the greeters were: Julie Brauninger, assistant principal; Becky Weber, principal, and Nikki Weber, assistant principal. The administrators dressed in the school theme “Space” attire. Students were welcomed with a New Year celebration. They got to wear hats, leis, and make a lot of noise with their horns and noisemakers. Students also learned school expectations as part of the celebration. Eddie the Eagle showed up to give hugs and high fives to the students. 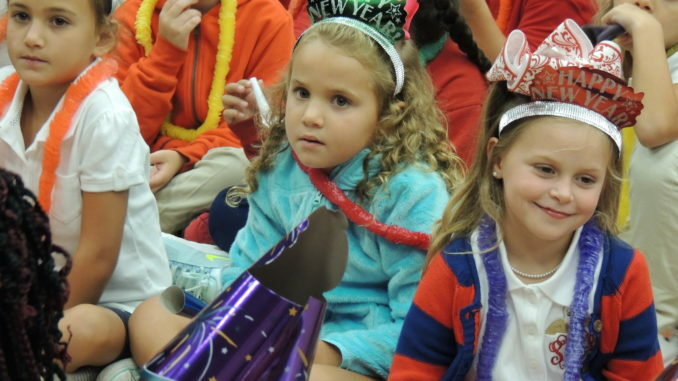 A New Year celebration for the PK4 class and kindergarten students will be held August 24.